As Britain's Secretary for International Development Hilary Benn says that the UK government no longer uses the phrase "war on terror", BBC News website world affairs correspondent Paul Reynolds looks at the use and now the disuse of this phrase. "War on terror" is both a defining and declining phrase. Its simple, some argue its simplistic, directness has come to represent the post 9/11 age and the worldwide campaign against al-Qaeda. But it was never accepted without qualification by many outside the Bush administration, especially when its meaning was extended to the counter- insurgency campaign in Iraq as well. Now Mr Benn has gone public with a ban quietly initiated last year by the British government, one of President Bush's closest allies in this "war". And in the US Congress, the Democrats, who triumphed in the elections in November, are moving to restrict and even ban its use as well. A leaked memo to staff on the House Armed Services Committee says they should "avoid using colloquialisms", including the phrase "the global war on terror". Instead, staff are told to be specific in their references - to the "war in Afghanistan" or the "war in Iraq" or to "ongoing military operations". 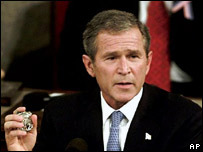 The phrase was first used by President Bush in an address to a joint session of Congress on 20 September 2001, in the aftermath of the attacks on New York and Washington. It was a moment that required memorable language, a ringing phrase, and his speech writer Michael Gerson provided it. In the speech, Mr Bush set up the phrase by stating that war had been declared on the United States: "On September the 11th, enemies of freedom committed an act of war against our country." From this it was a short step to announce that war had been declared on these enemies. "Our war on terror begins with al-Qaeda, but it does not end there. It will not end until every terrorist group of global reach has been found, stopped and defeated," he said. At this stage, the "war on terror" had a wide resonance, given the severity of the attacks on the US. However, it was never accepted by Mr Bush's critics, and not only in the Muslim world. The western media often used to, and still does, put it in quotation marks or qualify it as in "the so-called war on terror "or "the war on terror declared by President Bush" etc. Its use as a rallying call was undermined when the controversy over the detention camp at Guantanamo Bay raised questions about the tactics being used in this "war". But its decline probably really gathered pace when Mr Bush included the post-invasion war in Iraq as part of his war on terror. This was clearly articulated in a speech he made to the convention of the Veterans of Foreign Wars in Salt Lake City on 22 August 2005. "Iraq is a central front in the war on terror. It is a vital part of our mission," he said. "Terrorists like bin Laden and his ally, Zarqawi, are trying to turn Iraq into what Afghanistan was under the Taleban, a place where women are beaten, religious and ethnic minorities are executed, and terrorists have sanctuary to plot attacks against free people." The problem was that not everyone saw the war in Iraq as part of that original war against Qaeda. It was, after all, regarded by many as the result of what the then UN Secretary General Kofi Annan said was an "illegal" invasion. The decline of the phrase had set in. 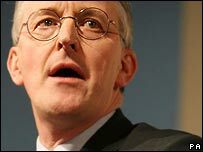 Hilary Benn, the British minister, now says: "In the UK, we do not use the phrase 'war on terror', because we can't win by military means alone, and because this isn't us against one organised enemy with a clear identity and a coherent set of objectives," he said. "What these groups want is to force their individual and narrow values on others, without dialogue, without debate, through violence. And by letting them feel part of something bigger, we give them strength." His remarks do not go as far as those of the British Director of Public Prosecutions Sir Ken MacDonald, who said in January this year that no such war existed and, further, that the very concept of a "war on terror" was dangerous. "It is critical that we understand that this new form of terrorism carries another more subtle, perhaps equally pernicious, risk. Because it might encourage a fear-driven and inappropriate response. By that I mean it can tempt us to abandon our values. I think it important to understand that this is one of its primary purposes," he said. It is not a question, for the British government, of abandoning the struggle. After all the British Prime Minister Tony Blair has been in the vanguard. But it is a question of redefining what is meant. The Pentagon itself tried to come up with an alternative with the phrase "the long war". This perhaps got closer to the concept that this is a conflict between ideas, and one that one might go on for generations. It echoes the phrase "the cold war" and immediately indicates that time and patience will be required, whereas the "war on terror" emphasised combat and quick results.